It’s every business owner’s nightmare to be victim of trespass; whether it results in theft, vandalism or damage to property as part of the trespass, having your businesses security compromised can be a timely and expensive exercise. Business owners put their personal time, money, energy and willpower into their business and risking it all is not worth it when you consider how readily available business security options are. Our man and dog security teams are your best chance at deterring and catching would be criminals at your place of business. The combination of expertly trained security guards with scent and suspicion trained dogs means all aspects of trespass are accounted for by our team. While not preferred some business types benefit strongly from yard security. Having a well-trained security K9 at your premises during evenings, weekends or high risk periods can help to deter would be criminals as well as track any who do decide to take the risk. 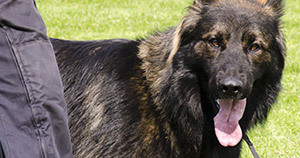 All of our security K9’s are trained specially for security and the correct dog will be hand-picked for your needs. Your business may benefit most from roving security guards on your premises. Whether used during evenings, during the daytime opening hours or a combination of both, our security team will keep your business secure. Whatever your security needs, Dog Security can meet the demand with the highest quality protection and service available. When you contact us we will thoroughly discuss your security needs in order to identify a solution that is perfectly matched to your property or event.